TRENTON – Attorney General Christopher S. Porrino and the Office of the Insurance Fraud Prosecutor today announced that a married couple from Bergen County have been charged with trying to defraud $20,000 from their insurance company by allegedly filing a false claim that their car had been stolen from a store parking lot. 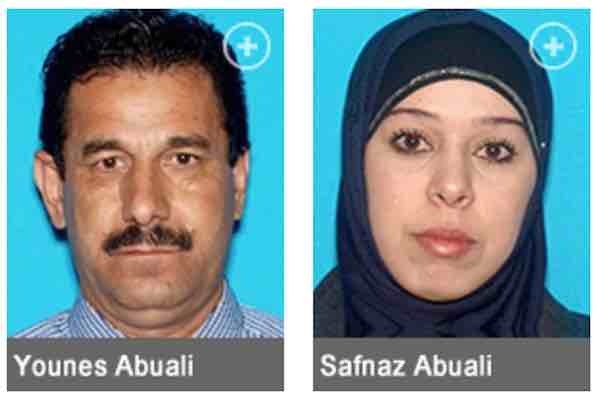 Younes Abuali, 53, and his wife Safnaz Abuali, 28, who live in Cliffside Park were each indicted on two counts of conspiracy (2nd and 3rd degree), one count of insurance fraud (2nd degree) and one count of attempted theft by deception (3rd degree). Safnaz Abuali was also charged with third-degree theft by deception, fourth-degree false swearing, and an additional charge of third-degree insurance fraud. According to the indictment handed up by a State grand jury, Safnaz Abuali, with the help of her husband, submitted a false claim to Progressive Insurance Company (Progressive) for the alleged theft of her 2014 Toyota Camry. The claim sought payment for the vehicle in the amount of approximately $20,000.00, alleging it had had been stolen from a store parking lot in Edgewater. The couple also gave false statements to Progressive in support of that claim, and enlisted Younes Abuali’s young son to make false statements, as well, according to the indictment. Safnaz Abuali was additionally charged with fraudulently obtaining the Progressive policy last year by falsely claiming on her application that she was single and lived alone, when in reality she was married to Abuali and he and his son lived with her. The indictment is merely an accusation and defendants are presumed innocent until proven guilty. Second-degree crimes carry a sentence of five to ten years in state prison and a criminal fine of up to $150,000; third-degree crimes carry a sentence of three to five years in state prison and a criminal fine of up to $15,000; fourth-degree crimes carry a sentence of up to eighteen months in state prison and a criminal fine of up to $5,000. Deputy Attorney General Fernando D. Maldonado presented the case to the grand jury. Detectives Amy Carson and Erin Lukowiak coordinated the investigation. Insurance Fraud Prosecutor Iu noted that some important cases have started with anonymous tips. People who are concerned about insurance cheating and have information about a fraud can report it anonymously by calling the toll-free hotline at 1-877-55-FRAUD, or visiting the Web site at www.NJInsurancefraud.org. State regulations permit a reward to be paid to an eligible person who provides information that leads to an arrest, prosecution and conviction for insurance fraud.